I let myself loose in the farmers market this past weekend. It’s a dangerous thing to do. I always want everything. There is just so much bounty there. You want squash? They have every kind. Fruit? Don’t even get me started. Three bunches of hearty greens for four dollars? YUP. SOLD. I strategically avoid the areas where they sell the meat and fancy cheeses, because that could be a problem for me. They are deliciously pricey. I want them. All of them. There is also an area where I only let myself go occasionally that sells goat milk ice cream and a booth that sells gluten free cinnamon coffee cake. Obviously, I want those things too. I am not shy. I love food. This time, I gave myself a budget of twenty bucks and it was off to the races. We were done shopping when the money ran out. We got a bunch of grapes, pomegranates, persimmons,beets, delicata squash,kale, chard, collards, some pickling cucumbers and some dill. Oh, and I also treated myself to a gluten free crepe with bacon and tomatoes. ( I obviously did not strategically avoid that aisle hard enough.) The husband got some coffee. We sat in the sun on that unseasonably warm Sunday and chatted it up with a good friend and her beautiful baby girl. It was a lovely way to spend a morning. I love that moment when you head home with all your loot! Oh, the possibilitlies. I remembered seeing a pin on pinterest floating around. It was a baked sweet potato that had been stuffed to the gills with goat cheese, roasted grapes and honey! Yes. I will take three, please. It looked like heaven. If I could put goat cheese on everything, I would. Sweet potatoes? Delish. 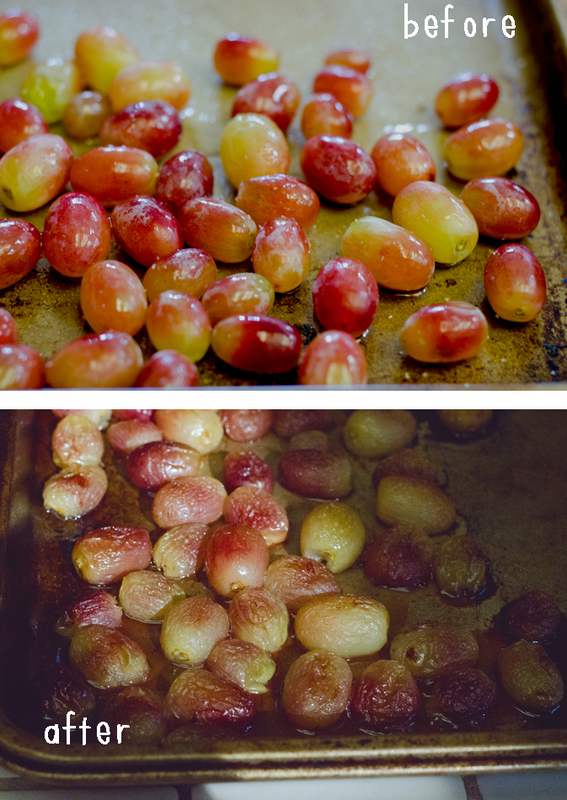 Roasted grapes sounded fancy and delicate and sweet! I had a bunch of grapes fresh from the farmers market! I needed to give it a go. I happened to have half of a leftover roasted butternut squash in the fridge begging to be eaten. I started to gather ingredients. Creativity ensued. Here is what I came up with. Sheesh. That is one smug butternut squash. Also, we have learned that the T-Rex has a terrible sense of interior design. Ugly little kitchenette. 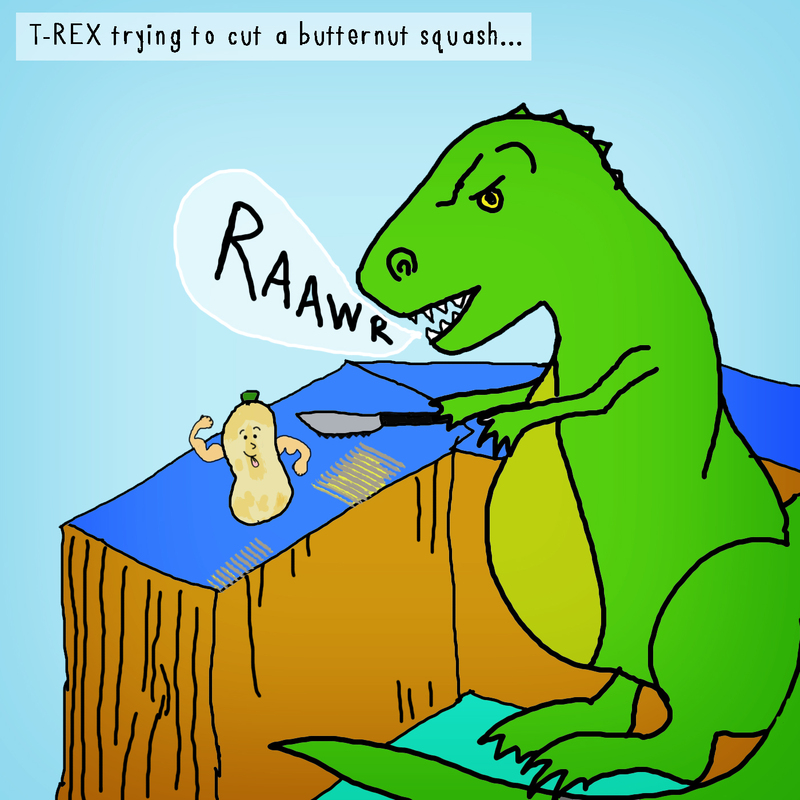 Once your squash is done roasting, crank up the heat on your oven to 450 degrees. Combine your grapes and grape-seed oil. Lay your grapes out onto a baking sheet and sprinkle with a pinch of salt. Put your grapes into the oven for 20 minutes, or until your grapes get nice and wrinkly and start to burst open. Roasting the grapes brings out all of their natural sugars. So tasty. 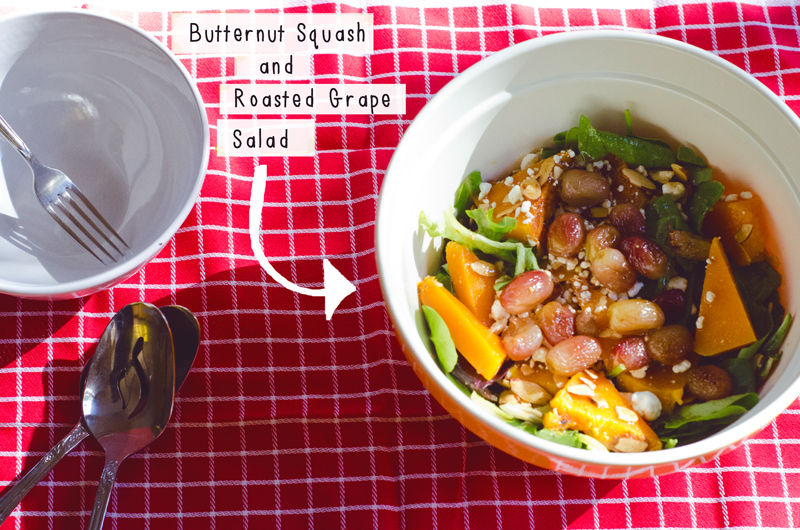 Once your grapes are done, assemble your salad. 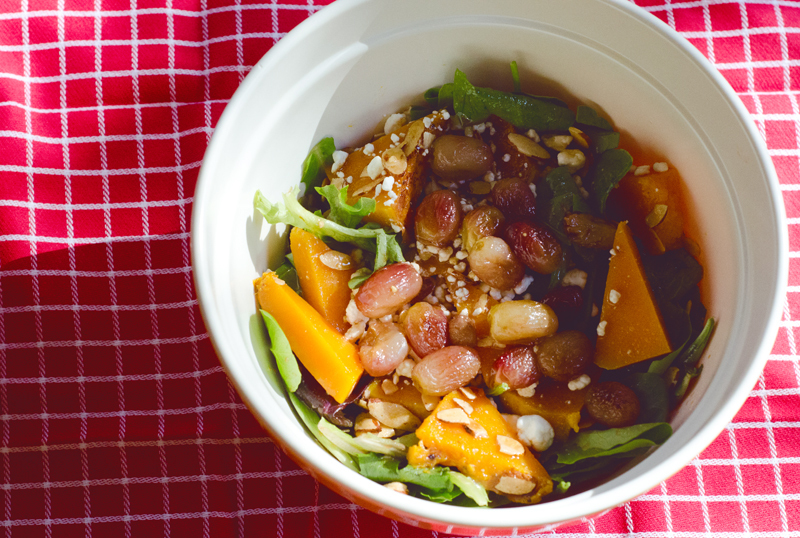 Greens, squash, goat cheese, nuts, and grapes on top. Whisk together your dressing ingredients to make your vinaigrette. Dress that beautiful beast of a salad. They are amazing. Highly recommend.